About 20% of our population is from outside the USA. All activities and cabin activities are instructed in English. The immersion into the American culture is part of the cultural experience for our internationals. Due to the size and capacity of some cabins, there is some likelihood that international campers may share a cabin with others from around the world. When possible, we arrange cabins with a good mix of Americans and International campers. Very little time is spent in the cabins each day, and our counseling staff do a very good job of maintaining an English-speaking cabin. We accept no more than seven campers per session who are native speakers in a given language. One of the purposes of most families enrolling their teenager in a summer camp in the USA is to learn more conversational English language. This avoids the tendency to just spend time with your primary language speakers. When booking flights please book them on a morning departure, arriving at Dulles International Airport, Washington, DC, between 2pm and 6pm. Your camper will be met by a Stone Mountain staff member immediately upon their arrival at International Arrivals, after they go through customs. We will call you when we meet them and again when they arrive at camp. NO, you do not need to ship your luggage UPS. You can check your bags at the airport and bring them on the camp van back to camp. International campers should have travel money for meals & incidentals while traveling. While at SMA most campers do bring a little spending money (approx. $100 for two weeks) for the Amish Market, county fairs, etc. You can easily write to your child by email. 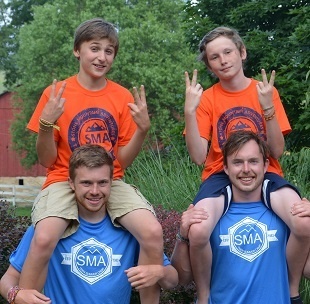 Send e-mails to your son or daughter to info@sma-summers.com and put your child’s name in the subject line. Please send only text. Campers can write back two times each session. Campers typically receive/make two calls per session. We will post dates/times for for campers to receive/make phone calls with boys and girls being on separate dates to alleviate phone congestion. It's important to stay in contact with family while attending a USA Summer Camps for Teens.